Pursuing an optometry residency can be a tough decision for students all too aware of the growing pressure of student loans. With stipends that are often half, if not a third, of what you could be offered in a job, pursuing a residency often means weighing the benefits of an immersive specialized education against the appeal of beginning to pay off your student loans. For an optometry resident, moonlighting opportunities, such as picking up weekend shifts, could mean a substantial boost to your income, as well as experience working in another modality. These 8 charts and graphs highlight optometrist salaries and student loans, and might help explain why more and more ODs are choosing corporate optometry modalities. This has been my experience picking up shifts at a local LensCrafters. I’m currently pursuing a residency in primary eye care with an emphasis on ocular disease, where I’m seeing my own patients, treating complex cases, and supervising externs. It’s everything I was looking for when I chose residency, but when a friend of mine told me about the opportunity to moonlight on weekends, I jumped at the chance. Technically, moonlighting is “casual part-time” work: it’s not officially part-time since you’re not regularly scheduled. Instead, you’re free to pick up a few hours each week, or only a few a month — whichever works for your schedule and needs. It’s easy to get started, too: all I needed to do was make sure my license and paperwork was in order, and then I spoke to a representative who helped me sign up to pick shifts that worked with my schedule. Corporate practices are always looking for optometrists to cover weekend shifts — easily the least popular time to go into the office — and those were the ones that worked with my busy 6-day-a-week residency schedule. Without further ado, let’s dive into all of the benefits optometry residents can get from moonlighting in corporate practice. I pursued optometry residency because I want to be the best clinician I can possibly be. My goal is to own my own practice one day, and I want to make sure that I can deliver the absolute best patient care. At the same time, I’m fascinated by medical optometry, and diagnosing and treating complex cases is one of my favorite aspects of optometry. Optometry residency helps me develop this skill set, but moonlighting has helped me put it into a wider range of practice. It’s also given me a better understanding of what real-world optometry is like outside of an academic setting. I want to practice in the medical model of optometry, and residency is one way to pursue that. However, an optometry resident sees a fairly specific subset of cases based on where and in what field they’re practicing. Moonlighting at a corporate practice, I’m able to widen my range of experience. At the LensCrafters where I work on weekends, I see a greater diversity of patients with a variety of conditions and needs. This kind of dual treating means I’m becoming even more comfortable diagnosing and treating patients. Check out the Complete Guide to Starting a LensCrafters Sublease. Being able to take what I learn in residency and apply it outside of the academic confines also builds confidence. It’s one thing when you are on your own with help or supervision when needed, but it’s another when you are truly on your own. Some other often-overlooked benefits of gaining that real-world optometry experience during residency is getting exposure to and additional experience with other important aspects of care that are not related to disease, like contact lenses, pediatrics, and refraction. These are also really critical skills, and even if ocular disease is your focus and passion, all of these skills are important and applicable. Often, in a disease-specific residency, you tend to forget there’s more to optometry than diagnosing and treating disease and can find yourself quickly forgetting about contact lens basecurves! While as a resident in primary care and ocular disease I’m seeing my own patients, many residents might not have patients assigned directly to them. Even if you have your own patients, you might not be required to meet the numbers or speed of regular practice. The methodology we learn in school is only streamlined with practice, and that’s what hands-on experience teaches. When you see patients outside of a teaching institution, there is more pressure and more urgency to improve your speed while maintaining quality of care. This is important in real world optometry, particularly for someone such as myself who wants to have my own practice one day. Additionally, by moonlighting I’m learning how a practice is run. I take every chance I can to ask my LensCrafters coworkers about the logistics of operating a practice, from billing and coding to office management. This is all important knowledge that I’ll need for my future career growth and ultimate goal of practice ownership. These important lessons are not focused on in optometry school, and aren’t the primary focus of a residency. They’re also lessons I’m learning while earning extra income and gaining valuable experience. This is, of course, The Big One. 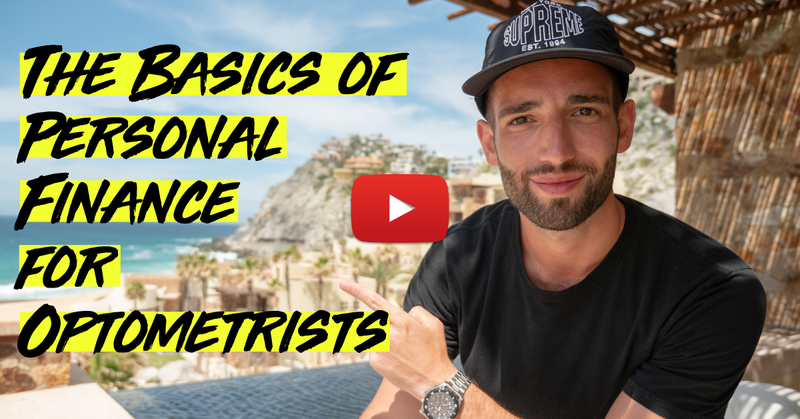 Everyone knows that residency stipends are nowhere near the salary you’d be making as a full-time optometrist in a practice. This is one of the main reasons new grad ODs elect not to pursue residency. However, my moonlighting at a corporate practice helps supplement income forfeited by choosing a residency and I’m learning so much about financial management. In the long term, I believe that this will help me strategically manage finances when I’m running my own practice, and I’m accumulating all the experience I can that will get me to that ultimate goal. In the meantime, the extra income I am earning helps pay down those awful student loans. Is moonlighting as an optometry resident an opportunity you should pursue? I would suggest moonlighting to any optometry resident, but especially to those whose ultimate goals are to own their own practices. Independent practice ownership might not be a major goal for everyone, but all optometrists can benefit from learning to strategically manage their own finances. Finally, getting to see other practice modalities is a huge benefit of this kind of work. You do not know what is out there, and what modality or setting you’ll enjoy the most unless you experience it. Dr. Nicole Akpunku graduated from the Illinois College of Optometry (ICO). At ICO, Dr. Nicole Akpunku was highly active in optometric organizations and served multiple leadership roles for the National Optometric Students Association (NOSA). Dr. Akpunku was on the national executive board as the national president of NOSA during her last year of optometry school. Prior to becoming the national president of NOSA, she served as two term President of ICO NOSA. Throughout her two-year term, she made it her ultimate mission to create sustainable programs that promoted access to visual healthcare for patients of minority populations. To this end she catalyzed several ground-breaking initiatives such as Eye See, Eye Learn, a program that brought pre-school aged children from the Henry Booth House (a local minority childcare program) to ICO and the collaboration with the Chicago American Diabetes Association’s (CADA) health and wellness expo.